Here is another free magic trick, I like to call the Quicksilver Card Change. Why? Because it is a blisteringly fast card change that looks like real magic. I am sure you are going to love performing this! EVERYONE LOVES FREE MAGIC... GET YOURS BELOW! THE EFFECT: The magician takes an ordinary pack of cards. The spectator can shuffle them is they wish. The deck is turned on it's side so the bottom card is facing the audience. 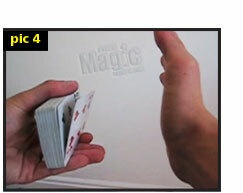 The magician's other hand is shown completely empty. With a simple wave of the hand the card visually changes to a completely different one! This tutorial CD makes an excellent gift. Grab yours on CD HERE. Begin with the deck in your hand on it's side with your fingers overlapping slightly (pic 1). Your other hand needs to secretly clip a card (face down) between your pointer finger and middle finger at the knuckles (pic 2). You can hold this hand down out of the spectators eye line at this point. Show the spectators the bottom of the deck and get them to name the card. Bring your other hand (and clipped card) up to the deck and secretly place it onto the small ledge your fingers have made (pic 3). This frees up your hand so you can turn it around and show that it is completely empty. Be careful not to flash the card that's on your fingers at this point. As far as your audience is concerned the deck is normal and your other hand is empty. You must keep your free hand covering the single card on your fingers at all times so the spectators can not see it. Don't cover the whole deck just the very bottom portion where the card is. When you are ready to change the card simply move your fingers up quickly causing it to flick up covering the bottom card. At the same time temporarily cover the whole deck with your other hand (pic 4). This blocks the spectator from seeing the move. Try and keep your hand and fingers (holding the deck) in exactly the same position before and after the flick move. If your fingers look like they have moved this can spoil the effect. After you change the bottom card magically you can perform a Double Lift to show that the initial card really has vanished. There are a variety of ways you can perform the 'change' move. ORIGINAL CHANGE: This is the first change I perform. It's simply covering the deck momentarily then removing your hand to show the card has changes. Straight up then down, plain and simple. SOFT CHANGE: This is the second change I perform in the performance video. I call it the soft change as I move my hand quite slowly in a circular movement. I like this style of change a lot, fluid and controlled it gives a nice effect. ELECTRIC CHANGE: The third change I call the electric change. Which basically involves you spreading your fingers and shaking your hand vigorously almost like an electric shock to change the card. CHOP CHANGE: The last change is my favourite because it is so instant. I call it the chop change because you literally karate chop your hand up and down really fast. This one takes a lot of practice! Because it is so fast you do not have much time to flick the card up. If you can master it though it looks amazing! An easier method of performing this trick is to begin with the card in the flick position with your hand covering it. You can then simply lift your fingers and change the card. However this watered down version is only recommended if you find the original method too hard. Because the whole effect is not quite as strong. TIP: Make the change more visual by changing a red card into a black or vice versa. Changing a black card to a black card or red to red will not look as good! TIP: Why not incorporate this free magic effect into another card trick? Get a spectator to choose a card. Control it to the top of the deck with a False Shuffle. Clip the card secretly between your fingers. Show the bottom card is not the spectators card then visually change it using the Quicksilver move. TIP: Watch your angles with this effect. Practice thoroughly in front of a mirror to perfect it. For another free magic card change click HERE.